There are basically two kinds of gilding: oil and water. Both types use very thin leaves of 22 carat gold or metal alloy. The amount of metals other than gold determine the color of the finished product. First gesso is applied to fill the imperfections in the wood grain, allowed to dry and then sanded smooth. The next step is a colored bole that shows through when the gold is polished through or worn off. This color is generally red, green, or yellow. On occasion, the white gesso is allowed to show through. Powdered gold is added to shellac and painted on as a base coat to fill the deep crevasses in highly carved pieces, and then covered with gold leaf. 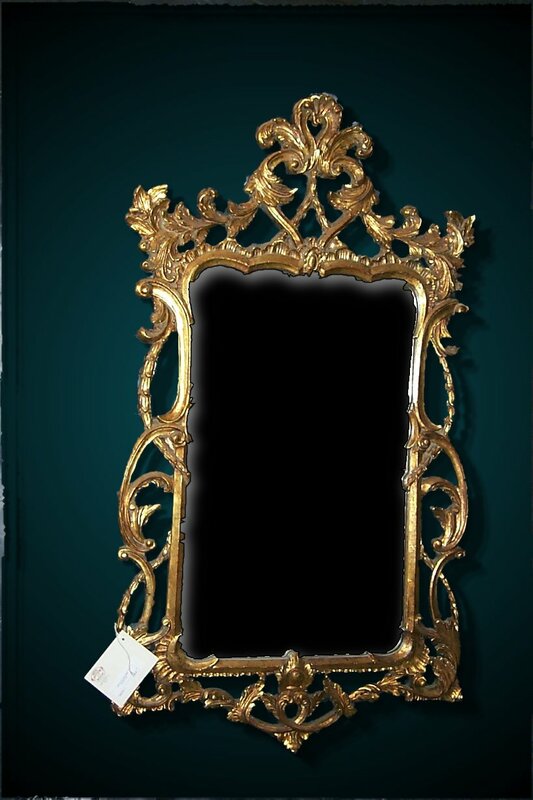 When you are looking at a gilded object like a mirror frame, the duller area is the oil gilding and the polished, shinny area is the water gilded area. Oil gilding is a technique where gold leaf is applied to a slow drying linseed oil and turpentine mixture called size. The slower the size drying time the shiner the finished product will be. Oil gilding is more durable than water gilding but can not be burnished to a high brilliance. Water Gilding is different from oil gilding because the gold leaf is floated over a thin layer of rabbit hide glue. This glue is very thin and allows the gold leaf to spread out smoothly. When the gold is set it is burnished with a smooth hard stone called an agate. Glazing is the technique used to highlight the definition of the carvings. A color pigment is mixed into a linseed oil mixture then applied over the gilded area. The excess is wiped off leaving only what has settled in the cracks and crevasses. The two pigments used most in my experience are burnt sienna and burnt umber, although green is used often to resemble tarnishing. Glazing can be removed by the touch when it is dry, therefore it is usually coated with a clear water white lacquer.